Easter events and activities at Disney World including church services, Easter Bunny and more. Easter is a sweet time to visit the Walt Disney World Resort. Spring is in the air and the Epcot International Flower and Garden Festival is in full bloom. Here are some of the special Easter themed events and experiences offered at Disney World. Christian performers included in the Garden Rocks Concert Series at the Epcot International Flower and Garden Festival at the American Gardens Theatre stage daily at 5:30, 6:45, & 8:00pm. These concerts are included with Epcot theme park admission. Garden Rocks Dining Packages are available at 14 different restaurants in Epcot. Prices vary depending on location; enjoy a lovely meal and get guaranteed seating at one of the evening concerts. Click here for more information. Egg-stravaganza Scavenger Hunt - April 5 - 21, 2019. Guests can purchase maps for $6.99 at Disney Traders, Pin Central, or World Traveler shops in Epcot and embark on a hunt for Disney character-themed eggs around the World Showcase. Once you’ve found all of the eggs, return to Disney Traders for a special surprise. Mr. and Mrs. Easter Bunny usually have a meet-and-greet location in the Town Square area during Easter and the Azalea Trail Maids are look lovely in their pretty Easter dresses in a pre-parade offered just prior to the afternoon Festival of Fantasy parade. Protestant and Catholic church services are generally offered in the Fantasia Ballroom at Disney’s Contemporary Resort. Guests are asked to use Disney park transportation to get to the resort as parking will be reserved for hotel guests. If you are staying at a Disney hotel, just use Disney transportation to the Magic Kingdom and take the walking path or the monorail to the Contemporary Resort. A shuttle bus may also be offered from the Magic Kingdom. If you are not staying on property, you can pay to park at the Disney Ticket and Transportation Center (TTC) and take the monorail system to Disney’s Contemporary Resort or free parking is available at Disney Springs where you can take a bus over to the hotel. The Protestant Service is at 8:15AM. 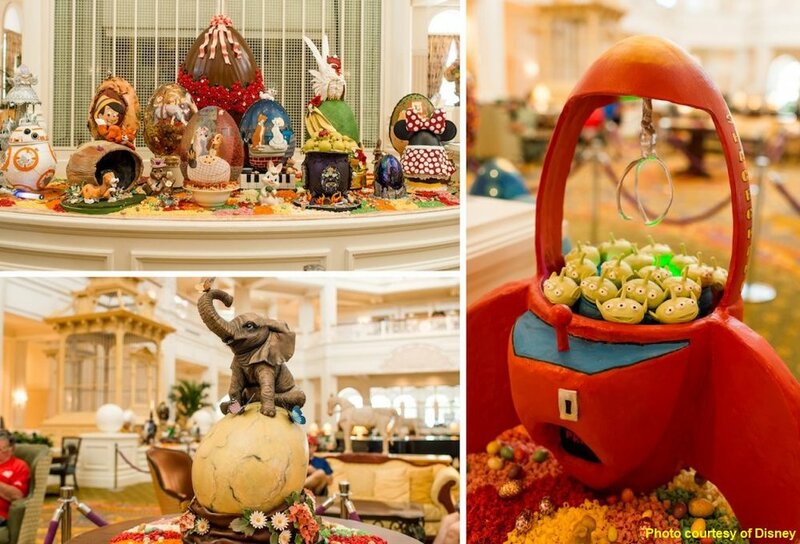 Easter egg displays at the Walt Disney World Resort Hotels - Grand Floridian, Disney’s Yacht & Beach Club, Disney’s BoardWalk Resort, and Disney’s Contemporary Resort. Easter Egg Display at Select Disney World Resort Hotels - you will find beautiful Easter Eggs on display that are created from chocolate, frosting and other edible materials. The most famous display is at Disney’s Grand Floridian Resort (displayed through April 27), which is an easy monorail ride over from the Magic Kingdom. Disney’s Beach Club Resort (displayed through April 27) and Disney’s Boardwalk Resort ((displayed through April 21)in the Epcot resort area also has a lovely display of beautiful Easter Eggs. Disney’s Contemporary Resort (displayed through April 27)has a much smaller display in their first floor lobby. Many of the official Disney World Resort hotels will have Easter activities that will be announced to their guests. Examples of past events include character meet-and-greets, candy scrambles, Easter crafts, and more. You might find a listing in the resort’s monthly recreation calendar or they may post activities in the days immediately preceding Easter. Disney’s Fort Wilderness Resort and Campground goes all out for Easter with a family fun run, an unofficial guest parade, and lots of fun activities for kids. There are lots of wonderful restaurant options for enjoying Easter brunch or dinner. Call 407-WDW-DINE for reservations unless otherwise noted. Le Cellier Steakhouse - Prime rib special (Available April 21 only) with herb brioche bread pudding, sauteed asparagus, horseradish cream,and au jus. Rose & Crown Dining Room: Sunday Roast Lamb (Available April 21 only) with mint sauce, roasted potatoes, Yorkshire pudding, carrots, and garden peas. The Rise ‘n Shine Brunch at Chef Art Smith’s Homecomin’ restaurant in Disney Springs - 10AM - 2PM. Easter Brunch with the Easter Bunny at Maria and Enzo’s in Disney Springs. Cost: $45 per adult / $20 per child. Enjoy a festive buffet of classic Italian dishes for the entire family such as Mascarpone French Toast, Poached Hen Egg & Quinoa Kale Salad, and hand-carved NY Strip Steak. The guest of honor, the Easter Bunny, will also be available for a complimentary printed photo souvenir. Click here for for the full menu. Call 407-560-8466 for reservations. Look for special Easter cupcakes and treats throughout Disney World and Disney Springs. Sunshine Seasons (Epcot) Easter Bunny Cake (Available April 21 only) - carrot cake topped with cream cheese buttercream. Kringla Bakeri Og Kafe (Epcot - Norway Pavilion): Springtime Lemon Cheesecake (Available April 21 only) - Lemon cheesecake topped with buttercream and chocolate eggs. Fountain View (Epcot) - Easter Basket Tart (Available April 21 only) - lemon tart with lemon curd and marshmallow mouse with phyllo dough basked with malted chocolate eggs. Creature Comforts (Disney’s Animal Kingdom) - Easter Egg Cupcake (Available through April 27) - yellow cupcake filled with Key lime curd topped with fondant eggs, coconut buttercream, and coconut shavings. Amorette’s Patisserie in Disney Springs has a Bumblebee Dome Cake (while supplies last), Bunny Macaron (available April 18-24), and a Bunny Petiti Cake (available April 18-24). Sprinkles Cupcakes - Disney' Springs - Easter Candy Cupcakes (also comes in layer cakes) - April 1 - 7 Robin Eggs Cupcake / April 8 - 14 Jelly Belly Cupcake / April 15 - 21 Peeps (Strawberry & Lemon) Cupcake / April 15 - 22 Lemon Meringue Cupcake. BoardWalk Bakery (Disney’s BoardWalk Resort) - Spring Meadow Cupcake (Available through April 21) - Spring Meadow Cupcake (available through April 21) – yellow cupcake with lemon curd, Swiss meringue, a chocolate basket handle, and buttercream frosting, flowers, and grass. The Mara at Disney’s Animal Kingdom Lodge - Spring Garden Cake (Available through April 21) – coconut cake with lemon mousse, chocolate glaçage, and coconut buttercream. Food courts at Disney’s All-Star Movies, Music and Sports Resorts - Easter Bunny Cupcake (available through April 22) – chocolate cupcake with marshmallow filling and sprinkles topped with green marshmallow buttercream, peach buttercream, and sugar bunny feet and tail. The Artist’s Palette - Disney’s Saratoga Springs Resort) - Easter Dessert (available April 18-21) – carrot cake filled with whipped cream cheese icing and garnished with a house-made white chocolate egg. Disney Floral & Gifts offers a nice selection of Disney themed Easter Baskets, gifts and flower that can be delivered to your Disney World hotel. Click here for more information. You can also purchase fully assembled Easter baskets or create your own at Goofy’s Candy Kitchen in Disney Springs. Some of the Disney resort gift shops may also have a limited supply of pre-made Easter Baskets. Easter sweets and treats are available at Disney’s Candy Cauldron and Amorette’s Patisserie! in Disney Springs.